Using multiscale approach for nuclear reactors simulations The required technological and safety standards for future Gen-IV Reactors can only be achieved if advanced simulation capabilities become available, which combine high performance computing with the necessary level of modeling detail and high accuracy of predictions. Interaction between different numerical codes working on various scales (DNS, RaNS, solid/structure interaction) on different parts of multiphase three-dimensional transient problem (such as nuclear reactor accident scenario) gives the ability to develop new multiscale multi-field models and simulations in various areas of nuclear engineering. Development of new spectral cascade transfer multiphase flow turbulence models The modeling of multiphase flows has wide range of applications in the fields of nuclear, chemical, biomedical engineering. Recent advances in the development of single and two-phase spectral turbulent models show promising results in extending those models to more complex type of two-phase bubbly flows (such as non-homogeneous conduit flows, boundary layer flows, free shear flows) and multi-component flows. The new generation of the advanced turbulence two-phase flow models will provide unprecedented abilities in designing new generation of safe and powerful nuclear power plants. Direct numerical simulation of single and multiphase turbulent flows DNS approach recently became an affordable tool in obtaining multiphase turbulence data for testing and validation of the new spectral turbulence models. Performing the DNS of multiphase flows using a state of the art massively parallel finite element based code (PHASTA) provides a unique opportunity to contribute to the development of new closure laws necessary for successful application of computational multiphase fluid dynamics in nuclear reactor thermal-hydraulics analysis. 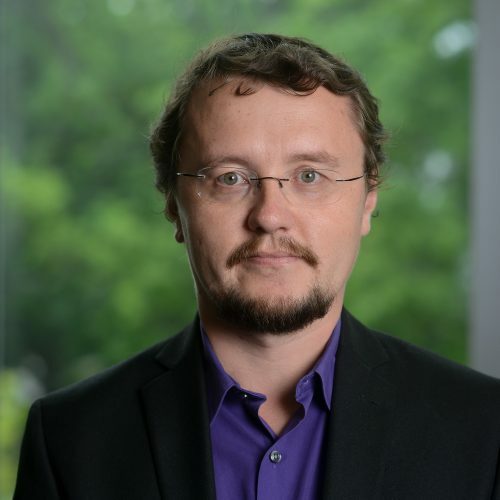 Dr. Bolotnov is interested in using multiscale approaches for nuclear reactor simulations, development of new spectral cascade transfer multiphase flow turbulence models, and direct numerical simulation of single and multiphase turbulent flows. Fang, J., Cambareri, J. J., Brown, C. S., Feng, J. Y., Gouws, A., Li, M. N., & Bolotnov, I. A. (2018), Nuclear Engineering and Design, 330, 409–419. Feng, J. Y., & Bolotnov, I. A. (2018), International Journal of Multiphase Flow, 99, 73–85. Guillen, D. P., Cambareri, J., Abboud, A. W., & Bolotnov, I. A. (2018), Annals of Nuclear Energy, 113, 380–392. Fang, J., & Bolotnov, I. A. (2017), Nuclear Engineering and Design, 323, 68–77. Talley, M. L., Zimmer, M. D., & Bolotnov, I. A. (2017), Journal of Fluids Engineering-Transactions of the ASME, 139(8). Feng, J. Y., & Bolotnov, I. A. (2017), International Journal of Multiphase Flow, 93, 92–107. Fang, J., Rasquin, M., & Bolotnov, I. A. (2017), Nuclear Engineering and Design, 312, 205–213. Feng, J. Y., & Bolotnov, I. A. (2017), Nuclear Engineering and Design, 313, 345–360. Brown, C. S., Shaver, D. R., Lahey, R. T., & Bolotnov, I. A. (2017), Nuclear Engineering and Design, 320, 309–324. A team of researchers led by the University of Wisconsin-Madison (UW), and comprising Texas A&M University (TAMU), California Institute of Technology (CalTech), and North Carolina State University (NCSU) is proposing to establish a university-based center focused on severe accident research and technical assistance. Our teamâ€™s research objectives are to: (i) conduct research in severe accident phenomena, in particular, those phenomena where residual uncertainties remain in light of Fukushima, and reduction of such uncertainties is warranted to address high priority Near-Term Task Force (NTTF) recommendations; (ii) provide technical assistance to the NRC related to post Fukushima safety and severe accident research; and (3) develop and maintain a repository of knowledge in severe accident research. Specific areas of technical assistance in which the center has substantial expertise and experience include in-vessel core heatup and core degradation phenomena; ex-vessel phenomena, including fuel-coolant interactions and core-concrete interactions; hydrogen mixing, combustion and control strategies; reactor system behavior under beyond-design basis conditions, and advanced modeling techniques, including reactor systems modeling and Computational Fluid Dynamics (CFD) methods that can be used in severe accident evaluation. The project technical objective is to develop and evaluate feasibility of a technical basis for the coarse-grained (CG) CFD capability that is needed for high-fidelity analysis of containment thermal-hydraulics. Specifically, the project will investigate a data-driven multi-scale framework having the potential to enable computationally efficient simulation of containment thermal-hydraulic processes. This project will develop methodology for verification and validation of advanced computer models used in Risk-Informed Safety Margin Characterization (RISMC) of nuclear power plants. The project will apply the methodology to selected problems in nuclear reactor safety. The focus is placed on computer codes that simulate external hazards that have impact on plant safety, including severe accident management and emergency response. The project will collect, characterize, archive, and use data from plant measurements, integral-effect and separate-effect tests to support code validation. The methodology will bring to use probabilistic risk assessment (PRA) to guide a risk-informed validation approach implementation. Quantification of nuclear power plant safety risk requires a systematic and yet practical approach to identification of accident scenarios, assessment of their likelihood and consequences. Instrumental to this goal is risk-informed safety margin characterization (RISMC) framework, whose realization requires computationally robust and affordable methods for sufficiently accurate simulation of complex multi-dimensional physical phenomena, such as turbulent and multi-phase flow. Turbulent Multiphase Flows for Nuclear Reactor Safety. This project will perform direct numerical simulation of turbulent, bubbly, two-phase flows, allowing for an unprecedented level of detail and, potentially, answers to fundamental questions about the interaction between the bubbles and the liquid turbulence. This knowledge will provide new information about the bubble's influence on the turbulence. The objective of the proposed research is to quantify bubble/turbulence interactions in a wide variety of flow conditions by analyzing experimentally validated interface tracking simulations and developing new turbulence-spectrum aware interfacial force models for CMFD and multiphase large-eddy simulations (LES). Fundamental understanding of forces governing bubble/turbulence interactions is a major key to the new generation of multiphase CFD and LES models which will allow virtual testing and design of multiphase flow systems. Over the past four years the Department of Nuclear Engineering at North Carolina State University has undergone aggressive growth, almost doubling the number of active faculty from eight in Summer 2007 to fifteen this semester, with one open junior position still in search. Among the new faculty added within this span of time three are senior faculty (including the Department Head) and five are junior faculty. [One Associate Professor, Dr. Man-Sung Yim resigned his position to become Department Head at KAIST, Korea]. With these additions the Department holds an excellent strategic position within the nuclear engineering education community due to its rejuvenated ranks and the ongoing smooth generational transition of its faculty with senior members mentoring the careers of junior members. However, the ongoing economic crisis and the decline of funding from the State of North Carolina are raising concerns that recruiting a highly qualified candidate to the open position currently in search and nurturing his/her academic career once hired will not be affordable. The goal of the academic development program proposed here is to assemble an attractive package to help the Department recruit a top-notch candidate in the area of nuclear power and to provide them a reliable resource to supplement the standard startup package in growing their career. The hired faculty member will be mentored by senior faculty in the Department, and will be afforded advice on means to best utilize this combination of standard and supplementary resources to propel their academic career towards success. The benefit to the faculty member will be realized when he/she eventually receives tenure thus consolidating their academic career path and embarking on the next stage by preparing for promotion to a higher rank. The benefit to the Department is the ability to attract top talent to apply for the open position, and to retain them in an academic career once hired. The benefit to the fields of nuclear science and engineering is to replenish and rejuvenate the cadre of academicians who will shape the future of nuclear energy in the US and globally through their research and by educating a new generation of nuclear professionals essential to implementing the nation?s nuclear agendas. Direct numerical simulation of turbulent bubbly two-phase flows at a leadership computing facility allows to obtain an unprecedented level of turbulent two-phase flow resolution and can answer fundamental questions about the interaction between the bubbles and the liquid turbulence. This knowledge will be used to improve the safety of light water nuclear reactors.